Here are the BinaryTilt ratings on bonuses, software, customer support and choice of trading option types. The ratings are provided on a scale of 1 to 100. BinaryOptionsWire, a foremost website which functions as an independent watchdog for the binary options market, voted BinaryTilt as the binary options broker with the best customer service for 2016. Looking at the customer support system, it is not hard to see why. 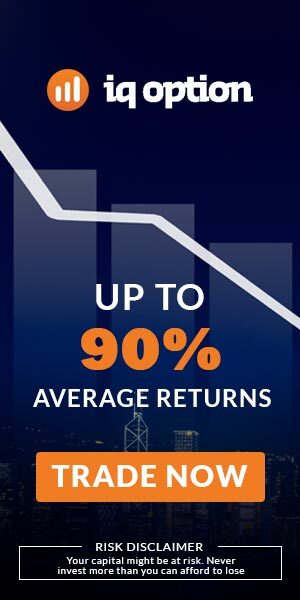 This is why a score of 95/100 is given to this brokerage. BinaryTilt is one of the new binary options brokers around. 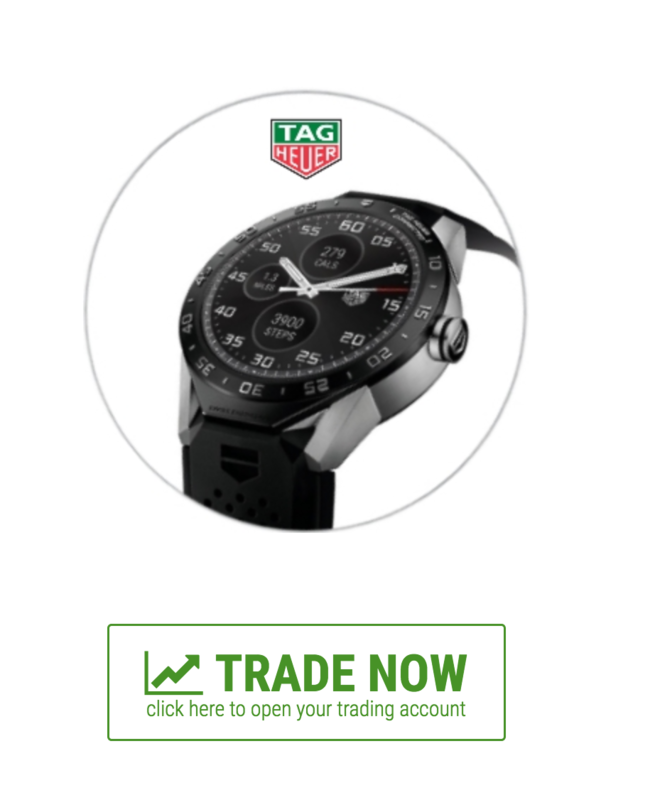 This review showcases what makes this brokerage an exciting prospect for traders. BinaryTilt is a binary options brand which is belongs to Chemmi Holdings Limited (Company number: 9870892). Chemmi Holdings is based in London, and launched its BinaryTilt brand in 2013 with a fully operational proprietary platform. The BinaryTilt brand is licensed by the UK Gambling Commission. Traders can trade 150 assets on BinaryTilt. These assets cover the major asset classes found in the financial markets. A comprehensive list of assets is provided below. Stocks: Adidas, 3M, AIG, Airbus, Cisco, Caterpillar, Alibaba, AXA, Axis Bank, Apple, Banco Santander, Baidu, Coca Cola, BHP, Bayer, BNP Paribas, CitiGroup, Google. Currencies: AUDUSD, AUDCAD, AUDCHF, AUDNZD, AUDJPY, EURAUD, EURCAD, CADJPY, EURUSD, EURGBP, EURCHF, EURNZD, EURJPY, GBPUSD, GBPJPY, GBPCAD, GBPCHF, GBP/RUB, NZDUSD, USDCHF, USDJPY, USDCAD, USDRUB, USDTRY, USDZAR, USDSGD. 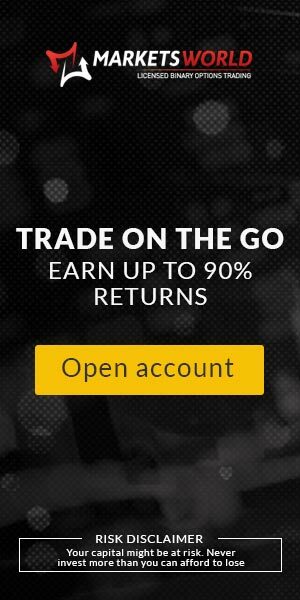 Bonuses of up to 100% of account deposit are awarded on BinaryTilt. BinaryTilt presents a mobile app for users that have access to smartphones that carry the iOS and Android OS. Download the apps from the respective app stores and start trading on the go. Credit card/debit card: Several card brands are accepted for use on the BinaryTilt platform. Starting from a minimum amount of $50, traders can use cards branded by MasterCard, VISA, VISA Electron, China UnionPay, Delta and Discover to transact and subsequently withdraw any profits made on the BinaryTilt platform. Bank wires are available to all traders on BinaryTilt, starting from a minimum deposit amount of $100. Digital Wallets: Binary Tilt features Skrill, Neteller, WebMoney and PaySafeCard as the digital wallet options. 250 units of currency for the USD, GBP and Euro constitute the minimum deposit amount. 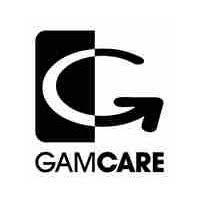 A live chat service serves clients round the clock from Monday to Friday. The email address at csupport@binarytilt.comis available for those who need support at anuy time of the day, all day, all week long. Phone: Two phone numbers are available for clients to reach BinaryTilt. +44 203 807 1553gives access to the London office while the Manchester office can be reached at +44 161 394 0459. An online contact form which delivers filled messages as emails is also available. So what’s the extra stuff available on BinaryTilt in terms of extra resources and features? 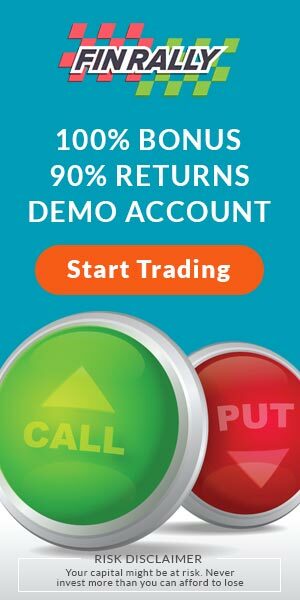 Rarely provided by other binary options brokers, a demo account is available for a limited period. An educational resource package which features video tutorials, webinars as well as written materials, are provided for the benefit of new users to the platform so that they can understand how the BinaryTilt platform works. Traders can delay expiry times to allow active positions which are not doing well the opportunity to get back into profit territory with the Roll Over function. Make extra money with the affiliate programs of BinaryTilt. 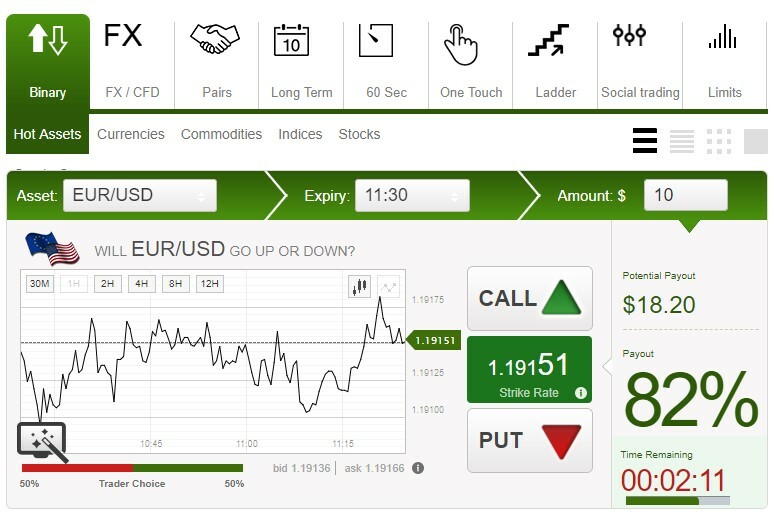 Close out profitable positions early and lock in profits using the Sell Position feature. Double Up is a function which enables a trader replicated a winning trade if there is the perception that prevailing market direction will continue. 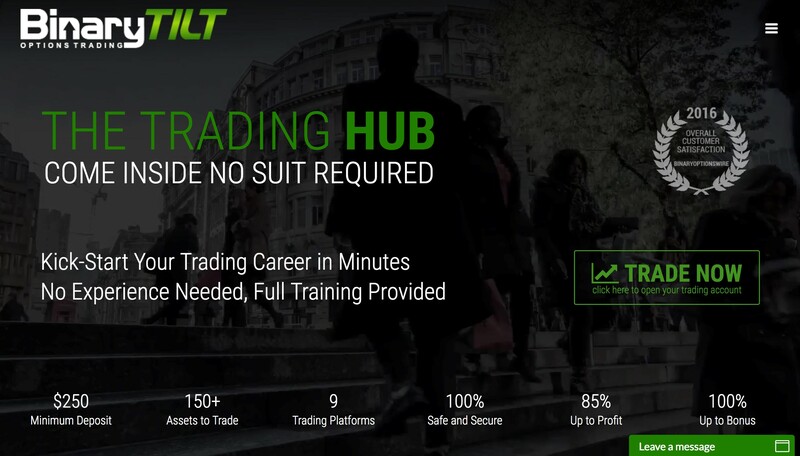 BinaryTilt may be new to the binary options market, but it has managed to put out a good product offering for its clients. Good options choices which are set against a trading platform with a pleasant UI makes for an attractive offering. BinaryTilt has also become a platform of choice for one or two binary options robots in the market. BinaryTilt can be described as a brand which is rapidly becoming a force to reckon with in the market. The customer support on BinaryTilt is exceptional, and clients and prospects have various options with which to get help on issues. With as many as seven types of binary options to trade on BinaryTilt, the excitement never ends. BinaryTilt is now a preferred destination for binary options robots. Those traders who love automated trading will love what BinaryTilt has to offer in this regard. Full regulatory status as a binary options broker has not been attained as the Gambling Commission remains the regulator of this market in the UK. Is there a minimum withdrawal amount at BinaryTilt? Answer: The minimum withdrawal amount is 50 units of currency for the USD, CAD, GBP and Euro. It is 650 ZAR, 6,500 JPY, 300 Chinese Yuan. What are the available binary options on the BinaryTilt platform? Answer: The BinaryTilt platform offers the following binary options: Long Term, Up/Down, Short Term, Pairs, Ladder, One Touch, 60 seconds and CFD/FX binary options. Where are the company offices of the company which operates the BinaryTilt brand? Answer: Chemmi Holdings have an office in London as well as St. Vincent and Grenadines. What options do I have when making deposits? Answer: BinaryTilt offers digital wallets, credit/debit card options as well as bank wire methods for deposits. Answer: At the moment, there have been no reports of scams perpetrated by BinaryTilt, its introducing brokers as well as affiliates. Can I withdraw my bonus as cash? Answer: The bonus is additional trading capital provided by BinaryTilt to match your first deposit. It is not to be withdrawn as cash, but is to be used as additional trading capital. It is meant to be paid back by generating a trade volume that is determined by the broker.